What we need is a good strategy and filter, a greater cybernetic component in the way we think. Therewith the value of this book, seemingly loosely organized but in fact craftily programmed to build from one good idea to the next. The value of being aware of algorithmic thinking—of the thornier details of “human algorithm design,” as Christian (The Most Human Human: What Artificial Intelligence Teaches Us About Being Alive, 2011) and Griffiths (Psychology and Cognitive Science/Univ. of California) put it—is not just better problem solving, but also greater insight into the human mind. And who doesn’t want to know how we tick? The authors lead us into the labyrinth with lessons on such matters as improved search and sort—sorting being “key to the human experience of information,” and thus a good thing to ponder, whether on how to organize your T-shirt drawer or your dissertation. The procrastinators and untidy among us will rejoice in knowing that sometimes a mess is not just OK, but even “the optimal choice,” as long as your search mechanism is good enough. Elsewhere, Christian and Griffiths apply Bayes-ian principles to gambling; if the reader does not emerge from the casino a winner, at least he or she may lose a little less. Most of the examples in this dense but lucid account are emphatically of the real world, but some are more meaningful than others: most people will find it better to know when to fold ’em, for instance, than to understand why Katy Perry can never possibly reply to all her fan mail. 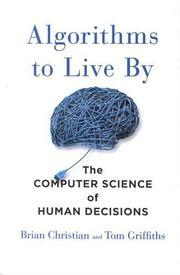 An entertaining, intelligently presented book for the numerate and computer literate.